Bill McKibben is an American writer and climate catastrophe activist who founded the Rockefeller-funded 350.org and is the chief architect of the failed 2016 #ExxonKnew effort to criminalize skepticism of his views. Though he does not have a scientific background, McKibben is a prolific writer on nature and climate change subjects. His intensely dogmatic climate writing and rage for justice stems in part from his religious beliefs about nature, and his personal conviction that American “hyper-individualism” and consumerism corrupt both the environment and humanity, exemplified by fossil fuels, industrial civilization and free market capitalism. Critics have observed that McKibben’s thoughtful intellect can be lost in his unscientific climate rants. 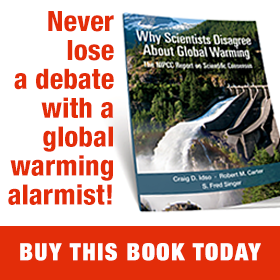 But even political adversaries such as climate realist Republican Sen. James Inhofe of Oklahoma acknowledge his intelligence, while deploring his loose and emotional treatment of facts. McKibben is noted for organizing online and live anti-fossil fuel global campaigns, particularly for major United Nations climate conferences. In 2009, he led organizers of 5,200 simultaneous demonstrations in 181 countries and in 2010 managed the 10/10/10 Global Work Party, which assembled more than 7,000 events in 188 countries. McKibben supervised two mass public actions, the People’s Climate March in New York City in 2014 and the 2015 Global Climate March. Throughout the Barack Obama administration, McKibben was a leader in the campaign to oppose the construction of the Keystone XL Pipeline, the Fossil Fuel Divestment campaign, the Keep It In The Ground campaign, the campaign to criminalize climate skepticism — which included collusion with the 18 Attorneys General for Clean Energy) and the #ExxonKnew attack campaign. In February 2014 McKibben condoned violence and criminal acts in service to the agenda of 350.org by giving his stamp of approval to group members in Houston, Texas who used the tactics of the Klu Klux Klan. 350.org activists stormed the home of Enbridge president Mark Maki with mask-covered faces, torches, and threats protesting the conviction of other protesters who faced three years in prison for felony criminal trespass shutting down an Enbridge Energy oil pipeline. The 350.org members called their assault “The People Face Enbridge” while hiding their faces. They also removed the picture of themselves from their website after police investigated the incident. 350.org is also behind a direct action effort to stop Enbridge’s LNG (liquefied natural gas) export terminal in Cove Point, MD. McKibben has led five incorporated and IRS registered campaign groups: Step It Up 7, 1Sky Education Fund / 1Sky Action Fund, and 350.org / 350.org Action Fund. Action Funds are 501(c)(4) lobbying and political campaigning arms that offer no personal tax deduction to contributors. According to the reference book Changing Climate Politics, McKibben’s major entity, the 501(c)(3) tax-exempt 350.org, is the largest and most influential global climate coalition, with a million-member following in over 188 countries, predominantly middle class college students and graduates. According to McKibben, “the number 350 means climate safety: we must reduce the CO2 in the atmosphere from >400 parts per million to below 350.” The amount of CO2 in the atmosphere today is above 400, and is expected to continue to climb as the economies of Asia and South America continue to advance. The earth experienced CO2 levels above 4,000 parts per million during the Jurassic-Cretaceous Ice Age. McKibben’s climate-related writing is characterized by blunt culture-war assertions that make questionable or unfounded claims, such as in the Preface to his 2010 book, “Eaarth” [sic]: “We’ve changed the planet, changed it in large and fundamental ways. And these changes are far, far more evident in the toughest parts of the globe, where climate change is already wrecking thousands of lives daily” [NOTE: This statement cited no specific locations, symptoms, or direct causes as evidence.] McKibben has written more than a dozen books on the environment, some of them best-sellers, including The End of Nature (1989), one of the first global-warming alarmism books written for the general public. McKibben has developed a complex personal support system to bolster his book royalties through silent allies. He has never drawn a salary from 350.org, his best known connection. Instead, McKibben depends largely on his affiliation with Middlebury College in Vermont, where he was appointed scholar in residence in 2001 and appointed Schumann Distinguished Scholar in 2010. The Schumann Center for Media and Democracy (SCMD) paid Middlebury College $1,200,000 to establish the position. At the same time, McKibben was a trustee on Schumann’s board with an annual compensation of $18,500. SCMD’s president was McKibben’s friend and PBS television icon Bill Moyers. McKibben’s job at SCMD consists mostly of overseeing the Fellowships in Environmental Journalism program. The Schumann organization, renamed the Schumann Media Center in 2011, continued to support McKibben’s campaigning, awarding more than $300,000 in grants to 350.org and 1Sky, an earlier McKibben nonprofit, as well as continuing generous grants to Middlebury College through 2014 and beyond ($250,000 in 2014, according to its IRS Form 990). Grants to 350.org pay for McKibben’s campaign expenses but not for personal salary. Kurtz’s hypothesis helps explain the outrage, hate and revenge seen in some climate catastrophists, a viewpoint found in much of McKibben’s own work. William Ernest McKibben was born on Dec. 8, 1960 in Lexington, Massachusetts and raised in a church-going family. A 2012 Boston Globe article traced the roots of McKibben’s commitment to social justice back to his childhood, where dinner at the McKibben house with his father Gordon and mother Peggy involved much talk of politics and current events. “The civic-minded, churchgoing family drove senior citizens to their doctor’s appointments, volunteered at the food bank, and worked to bring affordable housing to Lexington,” according to the Globe. The story traces McKibben’s writing career to his upbringing. His father, Gordon McKibben, was a well-regarded business journalist for Business Week and The Wall Street Journal, and spent 15 years as editor for the Boston Globe. In his high school years, the young Bill McKibben wrote for the local Lexington Minuteman, and honed his argumentation skills in statewide debate competitions. When he entered Harvard College in 1978 he joined The Harvard Crimson staff, became an editor, and was chosen president of the paper for his last year, 1981. According to the 2012 Globe article, drumming up topics for The Talk of the Town forced McKibben to prowl New York precincts that were both fine and miserable. Almost daily, he said, he saw the remnants of Emma Lazarus’ huddled masses and wretched refuse in the homeless community of New York. McKibben had brought his religious upbringing with him from Massachusetts to New York, and was a member of the leftist-activist Riverside Church. When his Talk of the Town editors approved a piece on homelessness, McKibben briefly lived on the streets for the story, and later started a shelter in the Riverside Church basement. While he was carrying out his homeless assignment, according to the Globe, McKibben met Sue Halpern — a fellow journalist and former Rhodes scholar whose own writing career would win her the 1998 Guggenheim Fellowship – and they clicked. In early 1987, Shawn was forced out of the New Yorker by its new owner and McKibben quit the magazine in protest. At the time, according to the Globe, McKibben and Halpern were engaged, got married, and moved into a fixer-upper house in Johnsburg, New York — a tiny hamlet in the Adirondack Mountains, the most-regulated semi-wild area on the East Coast. From their home in Johnsburg, McKibben and Halpern wrote and sold articles to Ms. Magazine, Harper’s, Rolling Stone, and Outside, and ran a summer journalism program at Bard College, which, according to the Globe, gave them enough income to live frugally. According to the Globe, the couple became involved with the writers’ colony at nearby Blue Mountain Center, where small-town kid McKibben fell in love with the snowy scenery, prompting an obsession with cross-country skiing and a book titled A Year of Living Strenuously. McKibben and his wife later moved to Middlebury, Vermont, and subsequently settled a few miles away near Ripton, helping to design their new home on land once owned by Robert Frost. McKibben’s appointment as a Middlebury College resident scholar in environmental studies in 2001 set him up to move from quaint to formidable, but it took six years. In early 2007 McKibben and several recent Middlebury College graduates created an activist organization called Step It Up, which engineered 1,400 protests around the country in April of that year to demand Congress enact a strong climate bill. In November 2007, Step It Up “came together under 1 Sky to present our leaders with the climate solutions that science and justice demand.” In 2008, Step It Up morphed into 350.org, but under the official name, 1Sky Educational Fund — which was not formally recognized as 350.org until 2010. 1Sky legally merged into 350.org in 2011. According to the Boston Globe, on October 24, 2009, 350.org held its first Day of Action, which consisted of 5,248 rallies in 181 countries. Foreign Policy magazine called it “the largest ever coordinated global rally of any kind” in history. On Nov. 9, 2010, Middlebury College President Ron Liebowitz announced that author and environmentalist Bill McKibben has been appointed to the position of Schumann Distinguished Scholar at Middlebury College — which gave him the resources to really make an impact. His 2010 Step It Up campaign broke his own record, with tens of thousands of people participating in more than 7,400 events in 188 countries. Afghani students planted trees outside Kabul, people installed solar panels on the roof of a South African orphanage, and McKibben’s mother Peggy — as well as other residents of her Bedford, Massachusetts, retirement village — gathered for an excursion to the compost bins. Bill McKibben now spends his life in the midst of the controversies his work generates. Sustainable Markets Foundation is a long-time pass-through donor to 350.org. The director of Sustainable Markets [$6,451,018 budget in 2014] is Jay Halfon, a treasurer and board member of 350.org. 350.org received $603,000 from Rockefeller Brothers Fund between 2008 and 2010, and passed through $390,000 to Bill McKibben’s 1Sky Education Fund. The Park Foundation gave SMF $200,000 in 2012 for anti-shale oil, anti-fracking campaigns. There is ample evidence to show how 350.org has used religion used to promote Climate Change Activism. Former chairman of the Rockefeller Brothers Fund, Stephen C. Rockefeller, was previously a professor of Religion at Middlebury, and coordinated the drafting of the quasi-religious Earth Charter for the Earth Charter Commission and Earth Council. In an effort to generate public support within the faith community, 350.org partnered with the World Council of Churches to enlist houses of worship in numerous countries to ring their bells 350 times during the U.N. Copenhagen Climate Conference on the weekend of December 11-13, 2009. Even the Communist website pushed the bell ringing and religion as a tool fighting climate change. Notable participants in this bell-ringing initiative included Archbishop Desmond Tutu of South Africa and the Archbishop of Canterbury, Rowan Williams. In addition, 350.org collaborated with such luminaries as Tutu and Avaaz.org executive director Ricken Patel, essentially a “crowd broker” with many contacts, to organize a religious candlelight vigil promoting the Copenhagen talks. The talks ended in failure, with no binding agreement made on any subject. McKibben’s 350.org commonly partners with 9 other coalitions, including Greenpeace, Res Publica, PAX Christi, the Regeneration Project, the U.S. Climate Action Network, the Rainforest Action Network, and the United Nations Foundation. At that meeting, college students and environmental activists, including 350.org activists, visited the WGF’s office to discuss launching a coal divestment campaign on the nation’s campuses. WGF gave more than 20 cooperating groups a substantial chunk of its nearly $15 million in grants in 2011 and 2012. Recipients included the Sierra Club Student Coalition ($180,000); the Hip Hop Caucus ($40,000); the anti-corporate lawsuit group As You Sow ($160,000); and 350.org ($205,000) to front the campaign. The scope quickly expanded from coal-only to any and all fossil fuels.